Foxfire Condos: WOW!! !...OCTOBER PRICE REDUCED $12,500 * BEST OF THE BEST * YOU SHOULD TAKE A LOOK * BEAUTIFULLY AND COMPLETELY UPDATED END UNIT VERANDA 2/2 + DEN + GLASSED LANAI WITH INTERIOR SLIDERS REMOVED MAKES FOR THE LARGEST MULTI-FAMILY IN FOXFIRE HANDSOMELY DECORATED & FURNISHED WITH NICE GOLF/LAKE VIEW * 2nd FLOOR WALK-UP * 2 SCREENED TILED LANAIS FRONT & BACK EAST & WEST * ALL NEWER KITCHEN, 2 BATHS, TILE FLOORING THRU-OUT, APPLIANCES, YOU NAME IT * GOLF CART LIKE NEW AVAILABLE FOR SALE * PRICE INCLUDES CLUB MEMBERSHIP WITHOUT INITIATION FEE OR DINING MINIMUM FOR 27-HOLES CHAMPIONSHIP GOLF, ACTIVE HAR-TRU TENNIS COURTS, DRIVING RANGE, 2 PUTTING GREENS & CHIPPING TRAP AREA * HANDSOME CLUB HOUSE NEWLY DECORATED 2018 WITH FITNESS CENTER, FINE DINING, GRILL ROOM WITH 7 TV'S, REAL LIBRARY & LOTS OF ACTIVITIES * ONLY MINUTES TO OLDE NAPLES BEACHES, 5th AVENUE BOUTIQUES & RESTAURANTS, I-75 ACCESS, HOSPITALS & WALKING DISTANCE TO ALL CONVENIENCES. Foxfire Villas Foxfire Condos: Peaceful views looking out to the golf course soothe you in this 2BR 2BA villa. Newer roof (2008), new heating & A/C (2011) updated kitchen and baths with new granite counters & new fixtures. New appliances (2014). New Italian porcelain tile floors look like wood & have a 50 yr.guarantee. Hallway opened up to guest BR & bath. Electric storm shutters on lanai. Impact resistant windows in BRs. Electric screen shade on garage door and rubber floor in garage. New paver patio in back yard. Unit is diagonally across from the pool and tennis courts (for exclusive use of Fox Glen residents & guests). 27 holes Arthur Hills designed championship golf; no initiaiton fee! Clubhouse with fitness facility with classes, full service restaurant, grill room for casual dining, library, Pro Shop, putting greens, driving range, practice sand trap area, Bocce, pickelball, 3 Har-Tru tennis courts and lap pool. 5 miles from downtown 5th Ave. dinng, shopping, live theater, art galleries and pristine Gulf of Mexico beaches. Easy access to I-75 No. and South. Close to Marco Island & Regional Southwest Florida airport. Foxfire Villas Foxfire Condos: Fabulous golf and water views from this 2 BR 2BA turnkey furnished villa with 2 car attached garage. New roof 2017. Newer water heater. Kitchen remodeled with new cabinets (2008). Recessed lighting, GE dishwasher, cooktop stove, built-in microwave, Whirlpool refrigerator, built-in desk. Plantation shutter on kitchen window. Dry bar in foyer closet. Doors removed from LR to lanai to create year round space. Master BR & guest BR have Plantation shutters on the windows. Comfort level toilets. New sink in guest bath with tub and shower combo. Kenmore washer & dryer across from guest bath. 27 holes Arthur Hills designed championship golf course. Clubhouse with full service restaurant, grill room, Pro Shop, putting greens, driving range, practice sand trap area, 3 Har Tru tennis courts and lap pool. 5 miles to downtown 5th Ave. shopping, dining, art galleries, live theater and pristine Gulf of Mexico beaches. Easy access to I-75 No. and So. 25 minutes to Regional Southwest Fl airport. Close to Marco Island. Foxfire Condos: Beautiful golf view from this sunny and cheerful first floor 2 BR 2BA turnkey furnished verandah at end of quiet street. New carpet (10/17), New roof (2014), new Heating & A/C (2007), new stainless appliances (2016), updated master shower (2014). Doors removed from LR to lanai to expand livable space. Screened and glassed lanai overlooking Holes #3 & 4 of Blue Course. Front screened lanai off courtyard entrance. One car detached garage. Private pool and tennis courts for Foxtail residents & guests. 27 holes championship golf included with no initiation fee. Clubhouse with full service restaurant, grill room, fitness facility, library, Pro Shop, driving range, putting greens, practice sand trap area, 3 Har-Tru tennis courts & lap pool. 5 miles to downtown 5th Ave. shopping, dining, art galleries, live theater and pristine Gulf of Mexico beaches. 25 min. to Regional Southwest Fl. airport. Easy access to I-75 No. and South. Close to Marco Island. Fox Club Foxfire Condos: C.15816 - A Rare Opportunity in the 27-Hole Championship Bundled Golf Community Fox Club! Enjoy this completely updated and well-maintained 3 bedroom, 2 bath, carport ground floor end-unit condo. Enter your new home through the formal living and dining area, open kitchen with 2 breakfast bars, which also opens to a separate family room. The family room offers a 180 degree panoramic view over the lake and 16th green. Create homemade meals in the newly appointed kitchen, offering 30" solid oak cabinets with granite counter tops & stainless steel appliances. Enjoy the newly updated bathrooms with frame-less glass showers, custom mirrors and 30" solid oak cabinets. Hassle free 18" floor tiles throughout the living area, lush carpeted bedrooms, 12" tile on the lanai. Master bedroom offers walk-in closet. Other updates include newer HVAC System (March 2015). Start enjoying all SW Florida has to offer! Only minutes to Old Naples Beaches and the Naples Pier as well as the 5th Ave & 3rd Street Boutiques & Restaurants & I-75. Foxfire Condos: MOTIVATED SELLER! Priced to Sell! Beautiful golf course and water views from this 2nd floor veranda unit. As an added value, the home has been expanded in both the lanai and the 2nd bedroom with an extra large bump out, and the best part is the lanai sliders and both bedroom windows are hurricane impact rated! The vaulted ceilings and neutral decor, give this home an open feeling. Also comes with a 1 car detached garage with room for your golf cart and extra storage in the attic. This well kept home is being sold turnkey and is ready for you to start enjoying the Foxfire and Naples communities. Fantastic opportunity to own in Foxfire, an affordable golf and tennis community that boasts 27 holes of golf, only a 10 minute drive to downtown Naples and the Beach with shopping and restaurants close by. Don't miss this one, it's ready for you to make it your own! Relax in the quiet surroundings away from the hustle and bustle but still be close to all the activities. Foxfire has plenty of activities including, tennis, swimming pools, fitness room, driving range and putting green. At the clubhouse you'll find, the grill room, dining room, library, and pro shop. Priced to Sell! Fox Hollow Foxfire Condos: Rarely available first floor 2 BR 2BA furnished verandah in Fox Hollow with beautiful golf course views! New roof (Oct. 2016), new exterior siding (Oct. 2016), new irrigation system for street (Oct. 2016). Paver walk ways and driveways. New heating & A/C system (2017). New water heater (2013). Garbage disposal 2011. Lovely paver courtyard, "bump-out" in guest bedroom. Newer washer and dryer. Lanai is glassed and screened. Comfort level toilet in master bath. Unit is just waiting for your decorative touches. 27 Holes Arthur Hills championship golf included. Unit is diagonally across from Fox Hollow pool (for exclusive use of Fox Hollow residents and guests). Loads of activities for members including Trivia night each week, book club, mahjong, bridge, poker, Travel club and much more! Foxfire Clubhouse with full service restaurant, grill room, fitness facility, library, bocce, pickelball, driving range, putting greens, 3 Har-Tru tennis courts and lap pool. 5 miles from downtown 5th Ave shopping, dining, art galleries, live theater and pristine Gulf of Mexico beaches. Easy access to I-75 No and So. 25 miles from Regional SW FL airport. Close to Marco Island. Foxfire Condos: Come enjoy the view and relax in your first floor bundled golf condo, overlooking the 4th hole on the Foxfire Country Club Blue course. Beautiful, custom landscaping greets you when you walk through the gate to your front door. Brand new carpet throughout and newer appliances and ceiling fans await you once inside. Sliding glass doors have been added on the lanai so you can enjoy more space inside while still being able to open the sliders and enjoy the breeze/view. The subdivision has a pool just steps away. Foxfire Country Club offers great amenities - golf course, tennis courts, bar/restaurant, community pool, fitness center, security gate, and much more. Fox Hollow Foxfire Condos: Sun drenched top floor 2 Br 2 BA furnished verandah in Fox Hollow section of Foxfire CC. New roof and skylights 2016, exterior painted 2016, new irrigation for street 2016. Newer Trane heating & A/C, new water heater 2016. Paver walkways and driveway. "Bump-out" in guest BR. Doors removed from LR to glassed and screened lanai to increase livable space. Electric storm shutter on lanai window. Screened front lanai. Extra cabinets under passthrough in Dining area for extra storage. 27 holes Arthur Hills championship golf with no initiation fee! Clubhouse with full service restaurant, grill room, fitness facility with Nautilus and free weights, separate fitness classes, library, Pro Shop, putting greens, practice sand trap area, bocce, pickelball, 3 Har-Tru tennis courts and lap pool. 5 miles to downtown 5th Ave. shopping, dining, art galleries, live theater and pristine Gulf of Mexico beaches. Close to Marco Island. 25 mins. to Regional SW Florida airport. Easy access to I-75 North and South. Fox Club Foxfire Condos: Golf & water views from this elegant 2 BR 2BA tastefully furnished condo in Fox Club. New water heater (2019), new heating & A/C (2017). New roof (2013). Kitchen updated with wood cabinets, granite counters, recessed & pendant lighting, stainless double sink, tumbled stone backsplash, tile on the diagonal throughout. Vaulted ceilings in MBR, LR/DR area. Two lanai areas-one at the front door (screened) & the other glassed & screened off the LR. Doors removed from LR to lanai to increase the livable space. Master BR has a walk-in closet with custom closet system, en-suite bath with new vanity, glass shower doors. Guest bath has new vanity with tub & shower. Newer washer & dryer. Unit is across from the pool & spa for Fox Glen residents & guests. Second pool & tennis courts for exclusive Fox Glen use. 27 holes Arthur Hills designed Chanpionship golf included; no initiation fee. Clubhouse with updated full service restaurant, grill room, fitness facilty, library, Pro Shop, driving range, putting green, practice sand trap area, lap pool & 3 Har-Tru tennis courts. 5 miles to downtown 5th Ave shopping, dining, art galleries, live theater & pristine Gulf of Mexico beaches. Fox Haven Foxfire Condos: Great unit in Fox Haven. This 2nd floor location has a great view of the golf course and enjoy watching the Eagles from your Lanai! Some of the upgrades include, kitchen and bathroom cabinets with granite counters (2015), including sinks and faucets, glassed in lanai with impact sliders, hot water tank 2015 . There are tiled floors throughout except for the guest bedroom. This unit is being offered Turnkey so you can bring your clothes and start enjoying all the community has to offer. Foxfire is an affordable golf and tennis community that boasts 27 holes of golf, is only a 10 minute drive to downtown Naples and the Beach with shopping & restaurants close by. Plenty of social activities to join within the community and at the clubhouse as well as, tennis, swimming pools, fitness room, driving range and putting green. At the clubhouse you'll find the grill room, dining room, library & pro shop. Fox Glen Foxfire Condos: Motivated Seller! This rarely available first floor unit in the beautiful community of Foxfire Country Club, is 1,200 square feet under air and has just been updated with level 3 granite counters, stainless steel appliances (coming Feb. 5th) and new cabinets in the kitchen and bathrooms. 20" diagonal tile in the living areas, carpet in the bedrooms. New hurricane impact resistant sliding doors enclose a perfectly sunny Florida room. Play 27 holes of meticulously maintained golf designed by the world renowned Arthur Hills or swing the rackets on one of many HarTru tennis courts. For non-golfers, you’ll stay busy with a packed social calendar offering an endless amount of events and activities or take the short 10 minute trip to Downtown Naples and the worlds best sunsets! Rent it when you’re not enjoying it with flexible lease limits and huge demand! Call today to have all your questions answered and to arrange a showing! Foxwood Foxfire Condos: This 2 BR 2 Bath 3rd floor condo has a hurricane rated glassed in lanai with has views of the Blue 2 fairway and green. A picturesque view of a preserve of cypress trees which often is inhabited by the resident American Eagle. The init is accessible from the common elevator. The unit includes a separate storage room for storage of your golf clubs and bicycles. With ownership you become an equity member of the Foxfire Country Club and it's three 9 hole executive golf courses. The Country Club has a first class workout center, pro shop, free driving range and a first class restaurant and bar. There are three tennis courts at the clubhouse and 4 additional practice courts at the community along with the use of two swimming pools and a hot tub at the community. Only 5 minutes from downtown Naples, beaches and 30 minutes from SWFL International Airport. Foxwood Foxfire Condos: It's all about the VIEW! Must see one of the Best Views in Foxfire. Imagine being able to enjoy this view from your screened in lanai. This unit is located on the top floor and the building has been recently painted and renovated. The unit inside has had some upgrades too, including all 18" tile throughout, 5" baseboards throughout, power reclining couch & chair, appliances including washer & dryer (2013) both master & guest bathroom cabinets, sinks and fixtures. There is an extra storage space in the building for the unit as well. The unit is being sold Turnkey so you can move in and enjoy all that Foxfire has to offer including the community pool and hot tub. This is a Fantastic opportunity to own in Foxfire, an affordable golf and tennis community, that boasts 27 holes of golf, is only a 10 minute drive to downtown Naples and the Beach with shopping and restaurants close by. There are plenty of activities including, tennis, swimming pools, fitness room, driving range and putting green. At the clubhouse you'll find the grill room, dining room, library & pro shop. Don't miss out on the beauty of this one! Foxwood Foxfire Condos: Motivated Seller, Price Reduced. Don't miss your chance to get this available 1st floor, turnkey condo in Foxwood. The building went through a renovation last season and the work is complete! This unit has 2 bedrooms & 2 baths, extra storage in the building and views of the golf course. Kitchen cabinets were refaced, extra cabinets added to provide storage, plus there is a separate pantry. The unit has a screened in lanai, perfect for enjoying the outdoors and watching the golfers! The unit is priced to sell and the owner is motivated. A/C 2003, HWT 2008. This is a fantastic opportunity to own in Foxfire, an affordable golf and tennis community that boasts 27 holes of golf, only a 10 minute drive to downtown Naples and the Beach with shopping & restaurants close by. Plenty of activities including, tennis, swimming pools, fitness room, driving range and putting green. At the clubhouse you'll find the grill room, dining room, library & pro shop. Foxwood Foxfire Condos: Super Cute Condo with Upgrades! 1st floor, 2/2 in Foxwood makes a great unit for an owner or a renter and is coming Turnkey. Upgrades include, kitchen cabinets, counters, fixtures, appliances and 18" tile floor. Crown moldings throughout, baseboards and plantation shutters on windows and sliders. A/C 10/2015, Hot Water Tank 11/2014. This unit comes nicely furnished and decorated with large screen TV's and parking spot right out the lanai. The unit is a close walk to the community pool and hot tub. This is a Fantastic opportunity to own in Foxfire, an affordable golf and tennis community that boasts 27 holes of golf, only a 10 minute drive to downtown Naples and the Beach with shopping & restaurants close by. There are plenty of activities including, swimming pools, pickleball, bocce ball, various activities at the clubhouse, driving range and putting green. At the clubhouse you'll find the grill room, dining room, fitness room, library & pro shop. Foxwood Foxfire Condos: Top floor, end unit 2BR 2BA furnished condo with sweeping views of several golf holes. New heating & A/C (January, 2019), new thermostat & humidistat (2017), new tile roof (2009), water heater (2013), new GE refrigerator (2015), new GE dishwasher (2014), new garbage disposal (2016), new Magtag washer (2011), new GE dryer (2014). Comfort level toilets in both baths (2011). Interior painted 2017, exterior painted 2018. Doors removed from LR to lanai to create additional living space. Lanai is glassed and screened. Guest BR has built-in Murphy bed system with bookcases. Unit is across from the pool and spa for Foxwood owners & guests. One car assigned parking (not covered). 27 holes Arthur Hills designed championship golf included with no initiation fee. Clubhouse with full service restaurant, grill room, fitness facility with classes, Nautilus and free weights, library, Pro Shop, putting greens, driving range, practice sand trap area, 3 Har-Tru tennis courts & lap pool. 5 miles to downtown 5th Ave. shopping, dining, live theater, art galleries and pristine Gulf of Mexico beaches. 25 min. to Regional SW FL airport. Easy access to I-75 north & south. Close to Marco Island. Foxmoor Foxfire Condos: This two-bedroom two bath apartment, turn-key furnished, third floor view overlooking the park and the county lake of the 27-hole bundled championship Audubon Arthur Hills Designed golf course in the gated community of Foxfire Golf and Country Club is now available. Foxfire is now a Blue Zone Community. The clubhouse, pool and hot tub are available for owners and guests of Foxmoor IV. Foxfire offers three Har Tru tennis courts, Pickle Ball and Bocce Ball, heated community pool, two putting greens, driving range and one practice green with trap. Fitness center, library, game rooms available for gin rummy, bridge and Mah Gongg. Clubhouse has fine dining and grill room with a bar with multiple tv’s. Vacant and easy to show. Make your appointment today to see this great buy. Rented until 04/22/19. call Listing agent for appt. 24 hours requested. Foxmoor Foxfire Condos: Top floor turnkey furnished 2BR 2BA corner unit with beautiful views. Tile roof, Trane heating & A/C. Impact resistant windows. Kitchen features refaced cabinets, & tiled floor. Living/dining with wall to wall carpet, chandelier, sculpted medallion in DR. Glass sliders open to lanai with peaceful views. MBR has large windows plus glass slider to the lanai. It has an en-suite bath with walk-in shower, comfort level toilet, refaced vanity with single sink, decorative lighting, mirrors and walk-in closet. The guest BR has wall to wall carpet, ceiling fan, light & double closet. There is a linen closet and guest bath in the hallway. The guest bath features tub & shower, comfort level toilet, refaced vanity with single sink, decor lighting & mirror. A full sized washer & dryer is in the guest bath. The unit is across from the Foxmoor pool & spa. 27 holes Arthur Hills championship designed golf. Clubhouse with full service restaurant, grill room, fitness facilty, library, pro shop, driving range, putting greens, sand trap area, 3 Har-Tru tennis courts & lap pool. 5 miles to downtown 5th Ave. shopping, dining, art galleries, live theater & pristine Gulf of Mexico beaches. Foxwood Foxfire Condos: Adorable 2 bedroom, 2 bath condo in Foxfire Golf and Country Club. New bathroom flooring put in since photos. New Heating & A/C (2017), Water Heater(2013), GE washer & dryer (2017), Tile Roof (2009). Private and peaceful screened lanai with serene views. Updated kitchen with granite counter tops, stainless steel Whirlpool appliances, built-in microwave, cooktop stove and crown molding throughout. Nice granite counters in bathrooms. Unit is across from pool and spa. There are two pools for this community plus private tennis court for Fox Glen residents and guests. Ownership of this Condo includes membership of the Foxfire 27 hole Arthur Hills Golf Course, including clubhouse with fitness center, library, pro shop, dining room, grill room, driving range, putting green, 3 har-tru tennis courts and lap pool. 5 miles to downtown 5th Ave. shopping, dining, art galleries, theaters and fabulous Gulf beaches. CARPORT located right in front. Foxwood Foxfire Condos: REDUCED!! Don't miss out on one of THE BEST PRICED 2/2 Condo's in Foxfire ready for a new owner! Upgrades include, New A/C in May/18, new dishwasher, newer floors in living area, hallway & both bedrooms with soundproof underlay 2015. This is a quiet 3rd floor end unit that has a view of the golf course and a screened in lanai for you to enjoy! This unit comes with a parking space and storage closet close to the unit. The owner is Motivated and makes this a great opportunity for YOU! The building just went through a renovation and is freshly painted. This is a fantastic opportunity to own in Foxfire, an affordable golf and tennis community that boasts 27 holes of golf, only a 10 minute drive to downtown Naples and the Beach with shopping & restaurants close by. Plenty of activities including, tennis, swimming pools, fitness room, driving range and putting green. At the clubhouse you'll find the grill room, dining room, library & pro shop. Fox Hollow Foxfire Condos: Entertain with ease in this light and bright condo with 1 bedroom, 1.5 baths, a newer roof, a detached carport and a secure private storage unit for your golf clubs and beach chairs. You will appreciate the special features such as a custom wood counter top on the bar between the kitchen and dining room, the extra storage in the master bedroom with custom cabinets, and the Murphy bed on the glass enclosed lanai. Play a round on the 27 hole golf course and then enjoy sunsets and watching the eagles and other birds from the comforts of your condo. Fill your calendar with the many social events at this friendly and financially stable golf and tennis community. 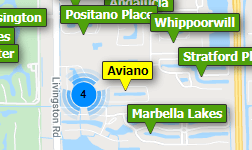 Or travel just 5 miles to world class dining and shopping and the beach in Olde Naples. All artwork, pottery, fountain and dishes on shelving unit in entry are excluded along with seller's personal items.